People who know me appreciate that I relish in crafting recipes with the fewest possible ingredients. By using the best quality nutrient-dense ingredients you can find, you don't need to mess with them too much or make recipes more complicated than they need to. "Keeping it simple" / "less is more" are excellent guiding principles in the kitchen as well as in life. If I open a recipe book and there are more than 6 ingredients my eyes start to glaze over. With only 3 ingredients, this soup/chowder was a breeze to throw together. And because each ingredent is so independently flavoursome and nutrient-dense they come together in a rich tasting soup that passed the "Test" (the "Test" being whether my kids go back for a second helping). Combine stock, salmon and cream in a saucepan and gently heat (but do not allow to boil) while mixing well with a hand held blender until very smooth. Season with salt and pepper. Garnish with chopped parsley and 1/2 to 1 teaspoon of wild salmon roe per bowl (if desired). Serves 4. This makes a gorgeous entree especially in these warmer months or a simple weekday family dinner served with some steamed vegetables or a garden salad. Fish stock is dead-easy to make: fill your biggest pot with fish frames (heads included), filtered water, pepper, garlic, bay leaves, thyme and a splosh of apple cider vinegar. Bring to boil then simmer for 1 hour. Strain and add 1 teaspoon of unrefined salt per litre of strained stock. If you don't have the time, energy or inclination of making fish stock yourself then just buy it from me or some other reputable source using quality ingredients with frames from wild (not farmed) fish. The other way I typically serve smoked salmon is to lay it in a platter with spoonfuls of home-made cream cheese (or store bough quark), chunks of avocado, and to dress it with lemon juice, extra virgin cold pressed olive oil, roughly chopped parsley, and season it with unrefined salt and pepper. Garnish with lemon wedges. A simple yet always impressive salad on any table. What's so bad about farmed salmon? 2 things- what they feed them and the conditions they are farmed in. They are touted as the "battery hens of the ocean". According to one website in addition to soy pellets (which are probably genetically modified and most definately toxic) the added ingredients you’ll get with a farmed fillet of salmon include dioxins, PCBs, fire retardants, pesticides (especially for sea lice), antibiotics, copper sulphate (to take care of algae on the nets), and canthaxanthin (a dye associated with retinal damage used to make grey farmed fish various shades of “wild” pink). That's somewhat sobering, don't you think? To cloud the issue further, there is a big difference between “wild caught” and truly “wild”. A “Wild Caught” label may only be telling a half truth. Many to most “wild caught” salmon actually spend half their lives in hatcheries (farms) before being released. Sneaky. While these quasi-wild fish are a better nutritional deal than fully farmed salmon, they are said to still bear the burdens of early exposure to toxins (dioxin, PCBs, etc.) and a less impressive omega 3:6 ratio. 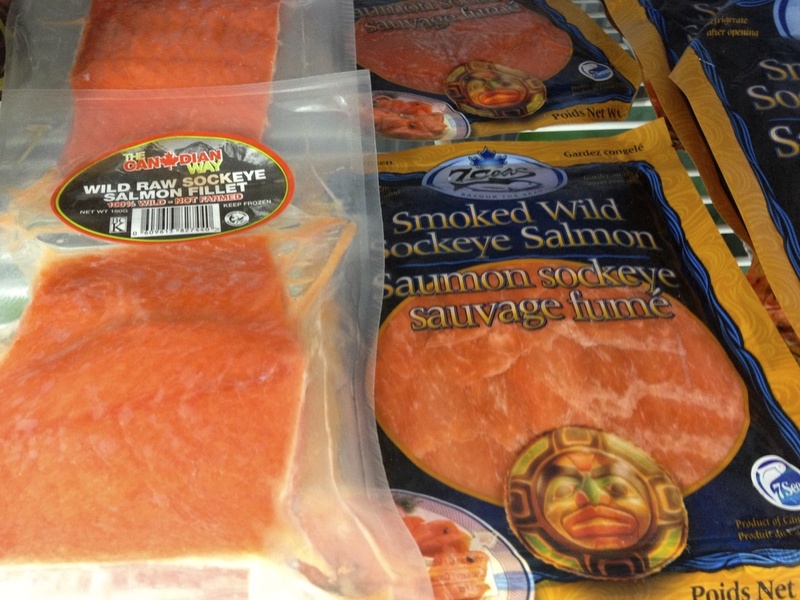 As far as I know Australia’s ONLY source of truly wild salmon is the Canadian sockeye salmon imported by David Cost-Chretien from The Canadian Way. It is second to none in terms of taste, texture and colour and has an unaparelled omega 3 to 6 ratio. David's wild salmon can be purchased directly from him (he home delivers) by contacting him on 0421 445 538 or david@thecanadianway.com.au or via his website, or he stocks his salmon at various organic stores including Wholefoods House, the new Bondi Wholefoods and GRUB. If you make my 3 ingredient smoked salmon soup let me know what you think. How do you serve smoked salmon?